Anyone who has tried to acquire any skill knows the old adage “practice makes perfect.” This is true of course. Steady, consistent practice time puts students on the road to mastery in all kinds of learning situations. However, the truth is that practice has to be optimized in order to help students excel and improve their skills. So what are some ways to optimize practice time in order to benefit students the most? Here are some general tips we at Superior Music Academy recommend. Remove distractions: Set aside a block of time and put aside all distraction such as cell phones, tablets and other technology. Also, let family members and friends know how important practice time is for helping you to achieve your goals. Set goals: What is life without challenges? No matter how long your practice time is, set clear goals to what you wish to accomplish in each session be it learning a new scale, or new piece, etc. Aimlessly practicing without a clear objective waste time and efforts and is likely to be an impediment to your overall progress. Practice smarter, not necessarily longer: Realize that longer practice times alone aren’t necessarily helpful. A focused approach where practice time is broken down into smaller sections is helpful for many students. At our piano lessons in Miami we teach our students to practice in fun and interesting ways. Practice away from your instrument: There is a scene in ‘The Music Man’ where Harold Hill (played by the late Robert Preston) encourages music students to sit and practice in advance of getting their instruments. Later, the students are actually able to play having never touched their instruments. While this is an exaggeration, accomplished musicians do use visualization as a part of their practice regimen. One technique is to bring your music with you and run through it in your head when you are away from your instrument. Have your supplies nearby: Keep your instrument, music stand, sheet music, metronome, etc., handy when you practice. Stopping practice to go searching for a needed item waste time and can cause you to lose focus. Take Breaks: Practicing while fatigued is not helpful for advancing with your instrument. Take micro-breaks before growing weary and come back to your instrument refreshed. Also, short breaks help to lessen the chance of developing injuries. Finally, at Superior Music Academy we have comprehensive programs in classical piano lessons in Miami. 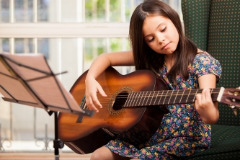 We also offer lessons in guitar, voice, cello, violin, music theory, ear training, harmony, and digital recording lessons. The focus is on giving students a quality education and helping them to develop wise practice habits that will help them to accomplish their musical goals.